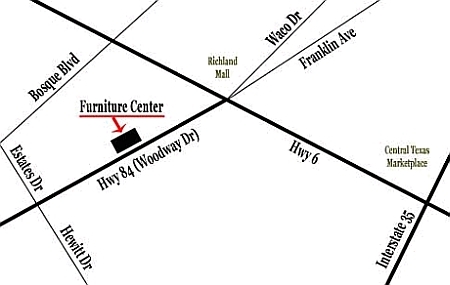 Furniture Center and Furniture Center’s Casual Shop is located on Hwy 84, one mile West from the Richland Mall. From I-35, exit #330 and go North on Hwy 6 for four miles to Hwy 84. Then go West on Hwy 84 for one mile and exit Sante Fe. Furniture Center is then on the right at 7405 Woodway Dr.